A bit of malted milk and a bit of chocolate are the perfect combination for these kid-approved candy cookies! Malteds bring back lots of memories for me. If you grew up in Canada, you probably remember The Malt Stop at The Bay that had a red stop sign as their logo. Every time we shopped there, I would beg my mom or dad to head to the basement to buy me one. I remember having it a lot, so I think it was a favorite drink of my parents as well! 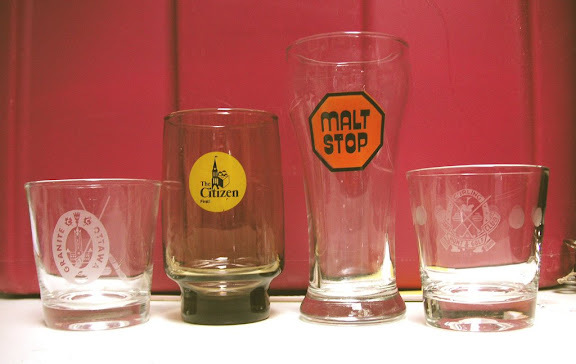 It was served in a special tall glass with a "Malt Stop" sign on it. Unfortunately, all the Malt Stops have closed. Photo from Flickr by "fortunate son"
If you know of a good place to get a malted milk shake, let me know. pass it along or leave a comment! Another favorite treat when I was growing up was (and still is!) 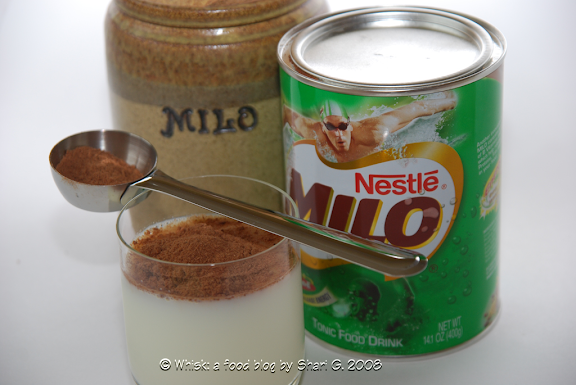 Milo, a chocolate malt powder that is a common drink served to children in Australia. When I was a kid, family friends would bring a tin back from their Australian travels, and we would measure it out tablespoon by tablespoon making sure we all had our fair share. We'd scoop it onto a tall glass of milk, eat most of the chocolate with a spoon, and stir in whatever was left into the milk. When I was travelling in Australia years ago, I tasted the best chocolate bar in the world — the Milo Bar. It was pressed Milo covered in chocolate. I savored every Milo bar I could find, and it's still my favorite chocolate bar, but unfortunately it's not sold in Canada. After some internet research, I found that the bar now has a caramel layer. Although I haven't tasted this version, I can't imagine it tasting better than the original. In fact, there is a petition to "bring back the original Milo bar!" Do you have a favorite candy bar that you can't get locally? What is it? 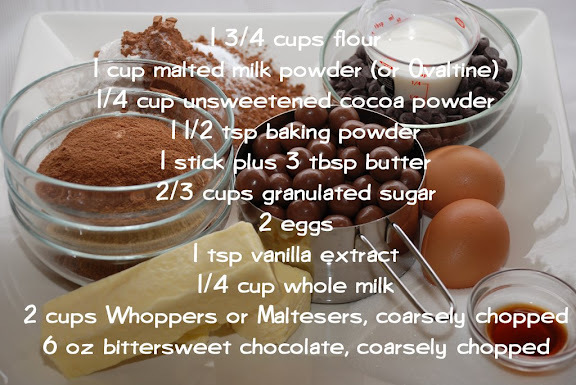 The recipe called for malted milk powder (or Ovaltine, regular or chocolate-flavored). "Which one I choose?" my daughter used to say. Instead of choosing, I decided to try a taste test and use Milo, Horlick's Malt Powder (vanilla), and Ovaltine (original chocolate). If you've never tasted Milo before, here's a great article that compares it to Ovaltine. This past weekend, we took a trip to a great winter ski resort close to Ottawa called Mont Tremblant. In the off season, it's a great place to hike, shop, golf, and eat! We did a lot of the last activity and not enough of the others! We ended up at an amazing restaurant called Plus Minus Café. From the amuse bouche, which was a spectacular drink that's worth a trip of its own, to the dessert, this restaurant blends the boundaries between art and food in a way I've never seen before. than the discovery of a new star"
You can find the recipe for Chocolate Malted Whopper Drops in the book Baking: From My Home to Yours by Dorie Greenspan or here. To see how the rest of the TWD group fared with this week's recipe, click here and then click on each blogger! Thanks to Rachel of Confessions of a Tangerine Tart who chose the recipe for this week. it should be 350 degrees F."
As one TWD member, Erin, suggests through her blog name: When in Doubt…Leave it at 350. My kids were thrilled after school this week. My youngest even lost her wiggly tooth after taking a bite of one of these delicious candy cookies! Of course, my favorite version of these cookies were the Milo ones. And, I'm glad to report that my kids liked these too. My husband preferred the ones made with Horlick's (Hmmph). The ones made with Ovaltine were our least favorite, but they were still delicious enough to gobble up. Wow! Who knew there were so many forms of malt! I, personally, am always on the lookout for Lion bars. You can't get them in the US. That and an orange flavored Twix that I had in England eight years ago. Nice cookies! Wonderful, wonderful references and links as always. They look perfect. Your photos rock and I loved the sugar coated spaghetti! Those are sooo cute! I love it! Great post! I learned so much, and I love that you kept the Milo Bar wrapper. I want some Milo!!! I never heard of it, but you've made a milo junkie out of me. Wonderful post! Your scientific approach to determine the best ingredients is excellent! I will have to pick up some Maltesers next time I am in Canada and do a taste off with Whoppers. What a great job! I always learn something from your posts! Thanks! And your cookies are fabulous too! I love it that you tried three different malted milk drinks! Fab job, as usual! Great post! I love all of your references. Your cookies look delicious! The sugar-covered spaghettini are too cute. I love the quotes throughout too. I am sooo done with you. I do cookies on a stick, YOU do cookies on a freaking sugar coated spaghetti? Gorgeous photos, Shari! I love the sugared spaghetti idea. It's a beautiful, dramatic, and playful presentation. My sister, brother-in-law, and neice recently relocated to Melbourne, Australia. I'll be sure to tell them to try Milo. They're homesick for Hershey's syrup, amongst other things. I'm sure they'll love it! I love the sprinkles spaghetti! How creative are you?? Sometimes I am not sure if I love you or hate you b/c you make the rest of us newbs look bad! haha. Great job! OK, this has to be the best TWD post I've ever seen! Very informative and entertaining. I know it took you a lot of time to assemble, so thanks! You almost make me like malt, ha ha. The Milo bar sounds like quite the treat. Oh Yum! Love whoppers around here. Milo is in abundance here in Kuala Lumpur ... maybe it would be exciting to exchange gifts or bake ingredients between you & your readers? Milo here can be found in its original form or in a 3-in-1 packs that means milo + sugar + powdered milk all mixed together in little packets .. just add boiling water & enjoy! Also can you teach me how to skewer the cookies into those spagetti cos cookies are already hard after being baked .. or they shd be done as soon as they are out of the oven? Please drop me an email at family_first3@hotmail.com I would really love to start this exchange program for fun! these whopper drops are like the ultimate childhood dream food! i do remember growing up to a mug of Milo or Horlick's Malt drink as a growing adolescent. those were the days ;) am still hooked on maltesers to this day though. brilliant! Wow! Great info about the different kinds of malted products. We only get Ovomaltine here :( but it was really intersying to read about all the others. The cookie "pops" are great and I think it's great you tried your different things! Note from Australia: I love Milo too - and lovely to hear that its fame has spread far and wide. The ad for Milo here says "Aussie kids are made of milo" - certainly the case for both me and my children. The absolute best way to have Milo is sprinkled over vanilla ice cream. Happy to post you some milo / milo bars if you like !!! The sugar coated spaghetti is so neat! What a cool idea. Sounds like there was a cookie for everyone. I also think it's neat that you kept the candy bar wrapper. Ooooh I absolutely love that sugar covered spaghetti! Gorgeous! And I am so craving a Milo bar now, and I've never even heard of it before today! wow, what a fabulous idea! Very interesting and informative post as always. I do love the sugar coated spaghetti. i'm not sure if somebody else has posted this - i've not read all the comments - but the "bulk barn" stores around ontario now have a great supply/inventory of english/british goodies so i'm thinking they might have the milo bar. i'll look next time i'm there and report back. jules someone - I'll have to keep my eye out for a Lion bar. According to Wikipedia, they can be found in some Canadian import shops. It looks delicious! rainbowbrown - Glad you liked all the references and links. It's so fun to research! kim - A compliment about my photos from you means a lot. Thanks! ~kimberly - At the restaurant, the sugar-coated spaghettini came sticking out of a glass of mousse at the resaurant. It looked so pretty and added some architecture to the dessert. the del sisters - Thanks, guys. It must be so fun to bake together. rebecca - I'm a bit of a pack rat! lori - Hope you get to try some Milo soon! carol peterman - I'm hoping to do a taste test between Maltesers and Whopppers someday too. the kitchen vixen - Milo is so much better than Ovaltine, but I'm biased! donna - Thanks for dropping by! mevrouw cupcake - Now I have an almost full container of Horlick's and Ovaltine to use up, tho!! engineer baker - The spaghettini is so easy to make (and the kids loved them). susie homemaker - Didn't you make the cute strawberry version? And the peanut butter version? And the original? And then put them on a stick? beth - Melbourne and Milo...let me dream about that for a bit! cb - I hadn't seen the strawberry whoppers until yours and susie homemaker's posts! Love it! n.o.e. - Glad you liked the post. It was fun to research! Lots of memory lane stuff for me! marye - Thanks for dropping by! I'd never tried Whoppers/Maltesers in cookies, and now I want to try other bars (Crunchie comes to mind). beth g. - I hadn't heard of Lion bars either, so now I need to find a store that sells them! 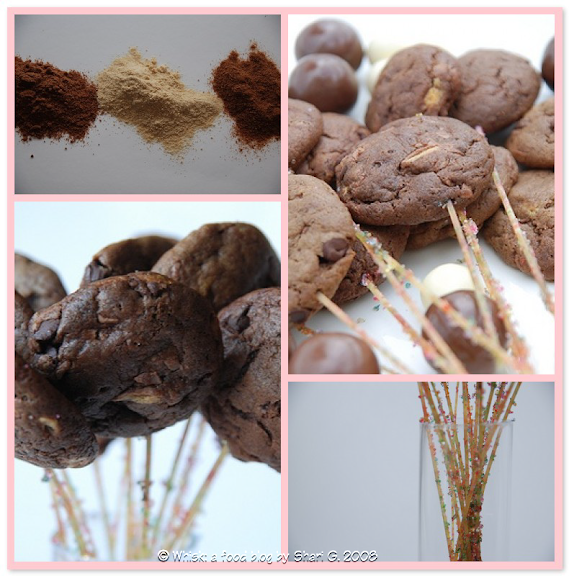 family first - I LOVE your idea of exchanging baked goods from different countries! Is there something from Canada that you would like to get? I'll email you. Anyone else interested in joining this swap? As for skewering the cookies, the spaghettini was too weak to hold a cookie, but the thicker spaghetti was fine. These cookies are so moist that they worked perfectly for this. No troubles. You could use two spaghettis per cookie to make them hold up longer than a photo shoot! diva - We enjoy using the Milo in the winter for hot chocolate. I'm going to have to pass along this Milo tradition with cold milk more often with my kids. clumbsy cookie - It's so interesting to find out what products are available in different countries. Wanna join the exchange?? suzie - I have yet to try Milo on ice cream, but I'm going to tonight! I'd love to exchange some baking ingredients!! pamela - I think I'm spoiling my kids. Now, when I make spaghetti, they're gong to wonder where the sugar-coated ones are! Thanks everyone for dropping by! It sounds like Family First, suzie and I are interested in a baking ingredient exchange. Email me if you're interested in joining in on the fun too! Your cookies look just perfect and the Milo bar sounds wonderful, too. 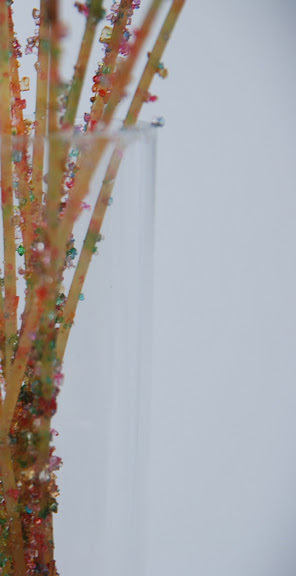 The sugared spaghetti looks amazing! ooh cookie pops are so tasty! Oh! Shari... and to say I thought I was the only crazy one. I mean, I know I've said it before: You just can't do things like other, can you? LOL LOL LOL Cookie pops!!! Again... great idea, as usual! great pics! Wow on all that research. OK, but - didn't someone mention you were kicked off the island already for making the rest of us look bad? Hmmm. Seriously - I LOVE coming here - I kind of make myself wait til I can pay attention and really enjoy your post (which is why I'm always late to the party). Thanks for always being so amazing and creative! You have my recipe piqued for malt now. Those look so delicious. I miss TWD but glad I am not packing on more weight either. You always do a great job! Jules someone- those bars sound amazing. I love the Canadian mint Aero. YUM! Fun variations! I baked mine at 375 since I didn't have time to go look through the site to see if it had been posted somewhere. They were still good! love the sugar coated spag! glad that you are able to find "proper" milo. when i visited singapoe, i noticed something called a "milo dinosaur" sold all over the place. it was ice cold milo with a big pile of undissolved milo sitting on top--delicious! oh, also, i lived in scotland for a year, and that Lion bar that jules mentions is awesome (i've seen it here in Oz, too)! Oh, fer crying out loud, woman, could your treats not be so perfect, just once? I need to know that you're really a human and not some food-making superhero. (lol, just kidding). Everything is just adorable, from the sugared spagetti to the cookies. Great post! Your cookies on a stick are just too darn cute! What a great way to present them! I love how you've made them into lollipops! These look too good! What a great idea to have cookies on lollipop stick! They look very good!